Our mission is to make beautiful new floors easy for our customers, by striving to resolve all concerns from pre to post installation. We regret to hear about your experience, and understand that we’ve spoken to you in regards to your concerns. If you continue to have questions and/or concerns please contact us at customersupport@empire-today.com. On April 2, 2018 I met with a salesman of Empire Today to select carpet. He was pleasant, professional and helpful. Due to a busy install schedule the carpet could not be installed until April 13th. I agreed to the date and 1130 install time. I had to take the day off work for the install and it was important for them to be punctual. The scheduler called me at 10:30am and stated that they were on the way. At 11:30 I called and again, I was told they were on the way. I waited all day and did not receive a call until 330 from an installer that claimed he was at my house when in fact he was not! I continued to attempt to contact a manager and did not receive a call until 530pm. The manager identified himself as Chris Miori. Despite being a manager Chris was unable to provide me a reason why they were a no call no show. He was unable to provide me any information at all. Chris claimed he was only able to offer me a $86 dollar credit. I was shocked after taking a day off work and a no call no show that $86 was his offer of resolution. After all Chris is the General Manager, he should be able to do more and must have some idea of what happened, but apparently not. I declined use Empire Today and told him we could cancel the contract. I told him I would go to RC Willey or another reputable company in the area. I told him I did not want to continue doing business with them and canceled the order. The following day I received a call the following day from another manager. He was apologetic and stated that he could have an installer there on April 19th. An installer would be there between 300pm and 500pm. He explained that Chris was aware of this and was hopeful to retain the business. In addition I was told they would also give me an area rug, and an additional $50 off. Specifically the rug would be a piece of carpet that could be used as a rug but due to the company not having a binding machine it would not be binded. I agreed to give the company another try. On April 19th I waited for the arrival and once again no one showed up at 300pm as Chris and the other manger promised. It was not until 800pm that the installer showed up after a plethora of calls to Chris. Once again Chris despite being the manager had no explanation of why they did not show up. The installer who clearly was unaware of all the issues began his work and was very polite. A few minutes into the job he alerted me that he was not provided enough material for the job and would have to come back another day, but he would finish what he could with the material he had. At 930pm I told him that my family needed to go to sleep. I attempted to call Chris but he did not answer. The following day Chris informed me that he was asleep when I had called. I was shocked by his response of sleeping when his customer and his installer were still dealing with the job. The following day Chris explained that they needed to send the installer with more material. He was scheduled a third time for Saturday April 21st. Throughout the process I spoke with a manager located in Chicago by the name of Angelica. She attempted to bridge the lines of communication and I was told since she was from corporate that she had more authority to help rectify the situation. I felt this was ridiculous for many reasons, she was in Chicago thus a time zone challenge, and second, Chris was a local General Manager of the area. Additionally the communication between the Chicago corporate office and local office was inaccurate, they were not communicating. This was evident after Angelica was able to provide me with an additional $50 discount, for a total discount of $130, when I was presented with the bill from the installer he was on the phone for 20 minutes because the discount was not reflected on the account. It took four weeks to complete the job. One no call or show from an installer, and two additional trip to complete installation. Two days of work that I took off for installation and countless calls between local and corporate management. The rug they promised was a piece of uneven, odd shaped scrap that was left over from the my job, this piece would have been discarded after the job. Upper management is clearly insulated by lower sub-par supervisors. When problems arise lower supervisors are neither empowered nor savvy enough to authorize compensation or solve the problems. Amazingly Chris the local General manger failed to even follow up or come in person to check the work that was performed after all the problems. The company touts affiliations of reputable business agencies and services but in no way shape or form shares the levels of commitment and service. My hope in taking the time to share my experience is to prevent others becoming victims of Empire Today. 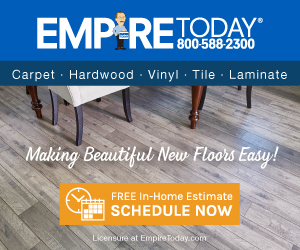 I would sooner walk on a dirt floor before using Empire Today for any flooring needs. Reason of review: Overall . I liked: Saleman and installer were very nice. I didn't like: Managers and resolution, Never showed up to install and never called, Lack monetary compensation. Review #1245073 is a subjective opinion of QuerulousCoati.